Meteorologist Chris Gloninger offers the weekend forecast. An approaching warm front will lead to building clouds, showers and isolated thunderstorms throughout the day today. 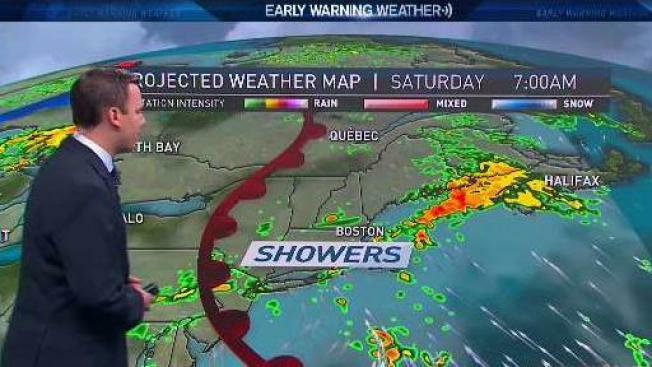 Showers and rain largely misses southern New England until the afternoon. Heaviest rainfall amounts will remain across New Hampshire and Vermont. Overall, not a total wash-out of a day with highs reaching into the mid 60s. Warm front will remain south of New England overnight. Fog and low clouds will increase, especially along the South Coast, as moist air mass streams across the relatively cold ocean waters. Threat of showers continues across the entire area with lows only dropping into the mid 60s south and mid 50s north with low cloud deck. Warm front finally lifts across the region on Saturday, ushering warmer and more humid air into New England. There may be some breaks in the clouds but, may be short-lived. Expecting any showers to have heavy downpours associated with them. Highs on Saturday will reach into the upper 70s to near 80 degrees. An area of high pressure located near Bermuda will continue to push warm and humid air into New England on Sunday. Expecting a mostly dry day on Sunday with a few isolated showers and thunderstorms. Highs reach into the upper 70s to middle 80s. Gusty southwest winds develop during the afternoon. A cold front approaches the region on Monday. With warm and humid air mass in place, expecting showers and thunderstorms to fire ahead of cold front. Some of these storms may become strong to severe during the afternoon and evening as daytime heating triggers increasing instability in the atmosphere. Expecting heavy rainfall with any storms that form. Highs on Monday crest into the upper 70s to low 80s. Cold front traverses across the region on Tuesday, bringing an end to the warm and humid conditions. Highs reach into the mid to upper 70s across New England. Looking ahead into the middle of next week, another cold front brings unsettled weather and additional showers and thunderstorms.